Beans and Christ were the primary focus of our float building today. We are still working with Jenn and Mandy on the Lutheran Hour Ministry float. The front of the float features a picture of Jesus Christ, this was the side we worked on for most of yesterday. Today the spices were being applied to His portrait, so we stayed out of the way. 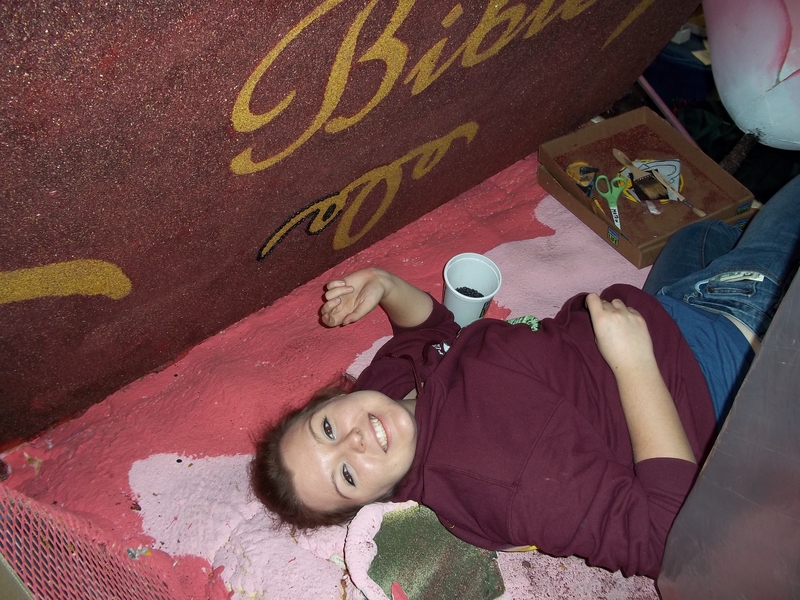 The back side of the float features the book cover of the Holy Bible, we spent a lot of time there today. Our job was to outline all the words with Beans, one at a time. There are a lot of tedious tasks in float building, we started on the Lutheran Hour Ministry signs picking the white rice out of the brown flax seed and vice-versa. Once that project was well manned, we moved on to other tasks. Jenn had made a decision to add black beans to the outline of all the yellow and red on the float. An unpopular decision because it was not in “the book”, but a valid decision because of the change it brings to the float itself, the letters really pop. Each float in the barn comes with a Crew Chief and a book. Phoenix Decorating designs the floats to their clients’ specifications through a process that takes most of the year. Once the final design is approved, the building process starts. All of the floats are motorized and many have parts that raise and lower so they can pass in and out of buildings. The tallest a float can be without having moving parts is 30 feet. Ministry signs picking the white rice out of the brown flax seed and vice-versa. Once that project was well manned, we moved on to other tasks. 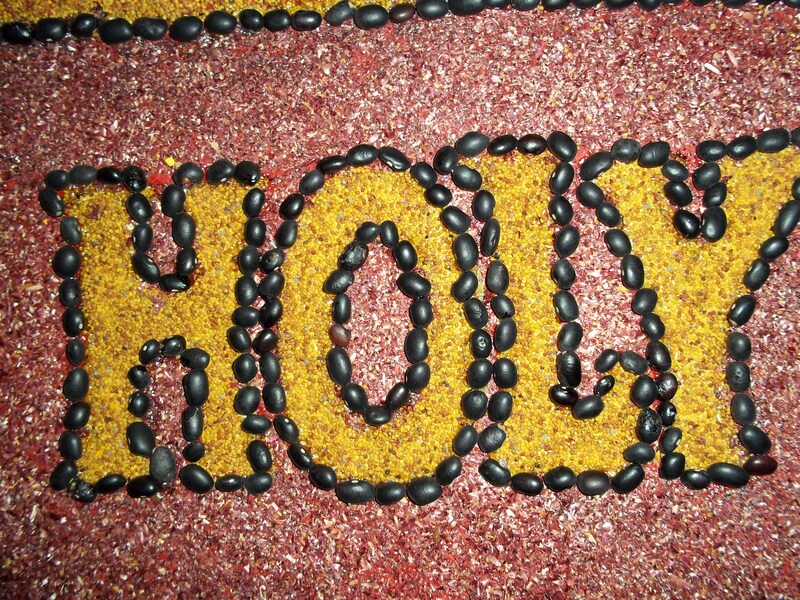 Jenn had made a decision to add black beans to the outline of all the yellow and red on the float. An unpopular decision because it was not in “the book,” but a valid decision because of the change it brings to the float itself, the letters really pop. The American History Museum has dinosaur heads that must be lowered; the HGTV float has trees that are currently leaning off the back of the float – these will all be raised after they leave the float barn and head down Raymond towards Colorado. There are at least three other floats in our barn with moving parts, some are height requirement imposed, others are animation. In addition to the building of the steel and Styrofoam of a float, there is a design book. It’s a lot like a set of architectural plans, there are lists of materials, pictures, colors and the like. All designed to give the builders their blueprints. It’s been interesting being so close to the float because you get to hear when things aren’t quite right. For example, we will start placing carnation petals on the paper mache roses on Friday, these are placed one at a time in a pattern and our crew chief is convinced we only have about half as many carnations ordered as we need. The beans are another area in which things aren’t quite right. The float is progressing beautifully and there are plenty of volunteers, so to keep everyone busy and happy, Jenn added beans to the outlines. The design crew complained, but truly it was the right thing to do. Tomorrow will bring more changes, I’m sure, we still have two full days of work before the judging begins, so plenty of time to contemplate better design ideas. I’ve decided float building is a lot like set building for theater. The difference is that in set building you only have to worry about the audiences perspective from the closest seat, and while that plays a part in float building because most of your “audience” is half a street away on the sidewalks, there are still plenty of people that will see the float up close and personal. The first are all the people who come in each night to view the floats. Every night is a different group being shown through the Rose Palace by guides, last night were LMU alumni. The second group of people who come through are the judges. While it would be easy to build to just the spectators, the judges are all important in this competition, not just for the sponsors and participants, but also for the float building companies like Phoenix. It’s a lot of pressure on a lot of people, I’m thankful I’m just a volunteer. This entry was posted in Uncategorized and tagged Lutheran Hour Ministries, Phoenix Decorating Company, Rose Palace, Rose Parade by Vagabond63. Bookmark the permalink.